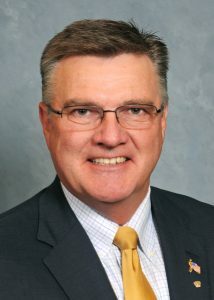 Randy Frese proudly serves as the State Representative of the 94th District. His reputation for integrity, professionalism, and service are the foundation of his success. Randy has demonstrated these values in his roles as a husband, father, small businessman, elected official, and civic leader. Randy was raised on his family’s farm in rural Illinois and earned his Bachelor of Sciences in Applied Sciences/Agriculture at Western Illinois University. After graduating from WIU, Randy learned about business traveling West Central Illinois. Based out of Macomb, he was first a sales and service representative for White Farm Equipment, and then he worked as an industrial minerals salesman. He soon returned to Adams County and began developing a series of entrepreneurial small businesses. Throughout his years as a small business owner Randy employed hundreds of individuals in the western Illinois region. He knows what it is to make the hard decisions of a small business owner, he knows how to maintain a budget and follow a plan, and he is able to relate and work with those who bring small business opportunities to western Illinois. Randy has been married to his high school sweetheart, Ronda, for 31 years. Randy and Ronda have raised three daughters – Laura, Jana, and Sara – not far from where they both grew up. The Frese’s have continued their family traditions of service to the community through involvement with professional, religious, service, political, and social organizations. They are members of the Adams County Farm Bureau, St. Thomas Catholic Church at Camp Point, and the Quincy Exchange Club. Randy has proudly served on the Board of Directors for the Adams County Fair, as well as the Quincy Catholic Charities Board. The Frese family is proud of their community involvement. As an elected leader, Randy established a strong record of efficient and effective public service in eight years as the Adams County Circuit Clerk. He has streamlined operations, repaired flawed administrative practices, expanded the use of technology to make information more readily available and usable, held the line on budget growth, and maintained a constituent-centered service model. Randy made it his priority to properly utilize his budget in the most effective way possible, while constantly increasing constituent service standards.